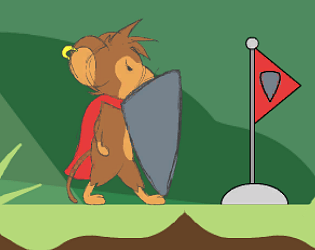 The game is all about a Mouse with a shield, and I tried putting in as much as you can do with that as possible. The shield lets you block things, of course, but you can also hold it above your head to float and hold it down to bounce off of dangerous objects (and go higher than you can normally jump). Also while you're sliding and floating, you will block as well. Nice multi purpose use of the shield. I feel like there should be some input changes for certain actions. Like pressing down to bash downwards should be down and shield button at the same time. And gliding should be holding shield and up button while in mid air. It's a bit more complex but makes more sense with a button being dedicated to using the shield. Otherwise, really nice aesthetic, animation, level design and shield use! I really like the mouse character. Very charming. I really appreciate the visual pun of a Mouse using a kite shield to glide through the air. I love it! Although it's not particularly innovative but whatever It's still a really good game and a fun idea! I made it to the middle of level three , right before the pillars where you had to use your shield to bounce up to the cliff. I like the character design and the the different ways you showed off your shield mechanic. I felt like the response time switching between down shield could have been faster and smoother. My favorite obstacle was crossing the pit bouncing off the plant projectiles. Great Job!